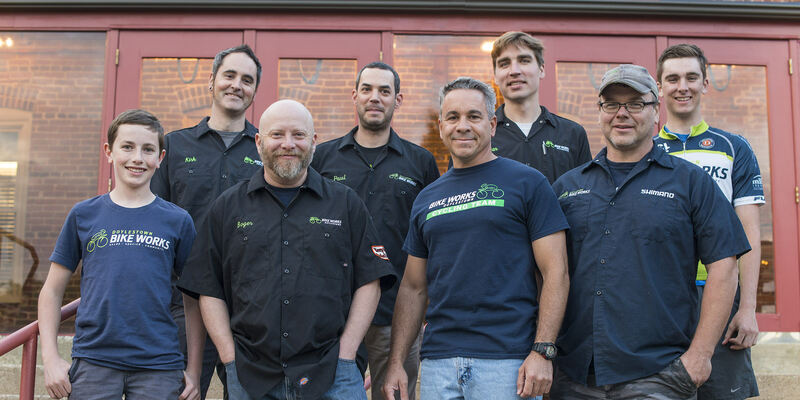 Doylestown Bike Works was created by passionate cyclists who wanted to create a space where people feel welcome no matter what type of cycling they're into. We are proud to be an employee-owned small business. Since 1999 Paul has worked in the outdoor industry, and has created long lasting relationships with each of his customers. Born and raised in the Philadelphia suburbs, Paul spent his childhood seeking adventure. These adventures have taken Paul all over the country, yet he never hesitates to call Pennsylvania his home. In 2005, while attending Barnett’s Bicycle Institute in Colorado, a chance encounter brought Paul to Doylestown. Family, friends, and customers will be the first to tell you that Paul is truly genuine. You will be the most important part of his day the second you set foot in DBW. Dan's past shop experience has included wrenching and sales for shops in the New England and Pennsylvania area. An apprenticeship was held for a year in Boston learning how to build and braze steel frames. This study led him to build his own steel Cyclocross frame. Recently, Dan attended UBI in Portland, Oregeon to study TIG welding and came out with his own 29er frame. Known to turn your old road bike into a single speed in mere minutes, he also enjoys tandem bicycle rides and playing drums. He is always willing to talk about custom frames and is hoping to sell his own line of bikes here at Doylestown Bike Works. Pronounced like “bagel” (but without the ‘b’), Egil is Norwegian for “follow my line.” Linus had his blanket. King Arthur had Excalibur. Egil has his bicycle. A lifelong Bucks County native with nearly 10 years of professional bike experience, Egil has worked on everything from a $12 yard-sale bike to a $12,000 dream bike. Egil makes annual pilgrimages to FrostBike, Interbike and Park Tool Tech Summit to keep up on the latest gear and training. A former machinist, born craftsman and natural problem solver, he gets the job done right. Brian is an alumni of William Tennent Sr. HS (Warminster, PA) and Penn State University. His athletic background was in XC/T&F and Ultimate Frisbee. He enjoys road riding, mountain biking, urban cycling and an occasional foray on a track or BMX bike. Brian is a geek for the history of local and American cycling. As a race director, Brian's palmares (italic) include several sets of Goldsprints indoor roller-races, and the "Lenape Scorcher" Pennyfarthing race (one of the two high-wheel races in America). His greatest source of pride is the impact DBW has made on our community. Brian is licensed by USA Cycling and the UCI as a Director Sportif of the Doylestown Bike Works p/b Fred Beans Cycling Team. He is particularly proud of his collection of cycling related patches, and his cycling neckwear. Fran is a hotel development specialist who considers bicycles to be his greatest hobby. Along with his wife and 3 children, he likes to ride with his family whenever possible. With racing behind him, these days Fran is an occasional roadie, still loves mountain biking and has a collection of quirky bikes that he likes to ride including a recumbent, a tandem, a folding bike, a single speed vintage Peugeot and a 25 year old restored Schwinn Klunker. Fran oversees the financial end of the business as he serves as the financial controller for DBW. Kirk was raised on the wind-swept plains of the Mongolian steppe. Born in a yurt, his formative years were spent engaged in animal husbandry and learning the ancient art of fermenting yak milk. Always impetuous, Kirk enjoyed the freedom of the saddle as his tribe defiled and pillaged their way from the Great Wall to the fertile river valleys of the Blue Danube. After finding his way to Pennsylvania, Kirk transferred this love of movement to the bicycle. While many miles from the land of his youth, Kirk’s spirit is often expressed by blood-curdling war whoops from the saddle.